"Superfoods Rx" author Steven Pratt recommends peppers as a food that is as unusually good for you as fast food hamburgers are unusually bad. "Good Eats" host Alton Brown recommends the sweet and spicy banana pepper for dishes ranging from stir fry to ice cream. Regardless of what you do with your banana peppers, conscious eating requires knowing just what's going on inside these colorful veggies. One banana pepper, approximately 4 inches long, brings 9 calories to the table. Only one of these calories comes from fat, reports nutrition resource website The Calorie Counter. According to Brown, typical recipes will call for anywhere between half a pepper to two or three. A typical serving of banana pepper carries one-tenth of one gram of fat, which is relatively low, compared with other foods. The fat in banana peppers is polyunsaturated fat, the healthy fat that contributes to production of heart-friendly HDL cholesterol. Only 1.8 grams of a 30-grams banana pepper consist of carbohydrates. That carbohydrate load consists of 1.1 grams of dietary fiber, known to contribute to circulatory and digestive health. 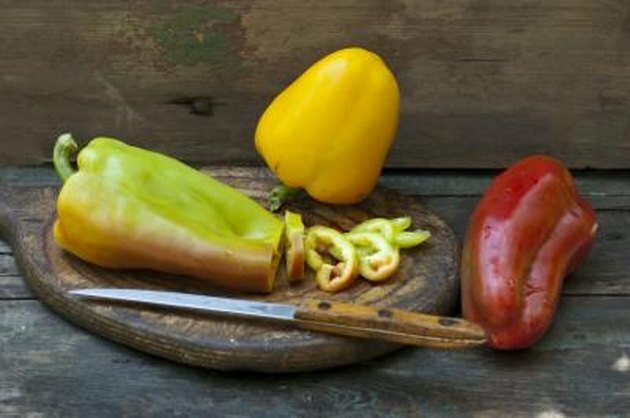 Peppers in general are sweeter than many other veggies, and banana peppers are sweeter than many other peppers. Of the remaining carbs, 0.6 grams are from simple sugars. Like most peppers, banana peppers are high in vitamin C. One serving provides 45 percent of the recommended daily allowance. It also delivers 2 percent of your vitamin A, 1 percent of your iron and half a gram of protein. Banana peppers are low in sodium, carrying only 4.3 milligrams per serving. They deliver 2 percent of the recommended allowance of potassium. Pratt's research suggests that banana peppers contain micronutrients, especially carotenoids, that contribute to overall health. Specific effects of carotenoids include decreased risk of cancer and reduced rates of heart disease. They contain the same micronutrient found in carrots, and they also contribute to eye health. The Scoville heat scale measures how spicy a food is by rating the capsaicin content, giving each food a rating from zero, not spicy at all, to a maximum of 16 million. Law enforcement pepper spray ranges in the 500,000 to 2 million range on the Scoville scale. Banana peppers rate a Scoville range of 100 to 500, spicier than bell peppers and less spicy than Anaheim green chiles.